Evolang is busy this year – 4 parallel sessions and over 50 posters. Also, the direction of the presentations might have changed between submission and presentation. We’ll be positing a series of previews to help you decide what to go and see. If you’d like to post a preview of your work, get in touch and we’ll give you a guest slot. Sean Roberts A bottom up approach to language evolution. Is bilingualism a puzzle for evolutionary linguistics? Why is there so much linguistic diversity? Is there an evolutionary explanation for the ability to learn two languages simultaneously? What I discovered was that different approaches lead to different conclusions. A bottom-up approach demonstrates that the questions above are not the right way to think about the problem. Essentially, the tools available for rational analysis tricked me into conceptualisng a ‘langauge’ as a fixed, monolithic, non-dynamic thing that people adopted, rather than something that is defined through use and changed by social contact. Below, I compare the top-down approach and the bottom-up approach. I conclude that there’s no need to hypothesise a separate ability for learning multiple languages: being able to condition linguistic variation on semantic variables is enough. Question: When is bilingualism a rational expectation? Assumptions: Assume a rational prior over the number of languages to expect in the input. Represent languages as monolithic, static entities. Social structures are simple and fixed. Changing the social structure changes the rational expectation. Method: Rational/Bayesian model. Individuals learn by calculating the rationally optimal response given input data and an innate bias. Conclusion: There is a rationally optimal prior expectation for the number of languages to expect in the input (depending on your social structure). This is a fairly boring conclusion: Bilingualism is rational in a complex social structure. However, this approach has assumed an innate ‘bilingual ability’, separate from the general language learning ability, that even nativists don’t consider. For examples of this kind of approach, see Abrams & Strogatz (2003), Burkett & Griffiths (2010). Question: How do social structure and variation co-evolve? Assumptions: In the real world, languages are defined by social structure, politics, history, geography and identity. 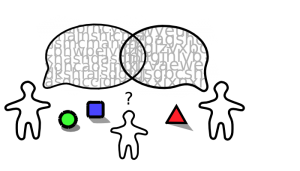 This model represents linguistic signals as continuous variation tied to specific speakers. The variation is meaningful (it refers to aspects of the world). Social structures are dynamic. Method: Regression model. Individuals learn by conditioning linguistic variation on continuous semantic variables. 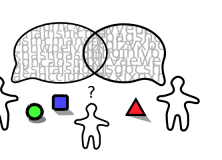 Speaker identity is a possible conditioning variable. If speaker identity is an important factor, then bilingualism will emerge. 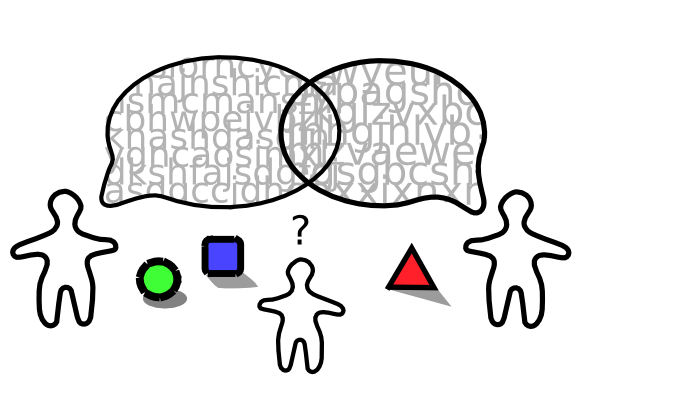 A concrete measure of bilingualism is defined as “the difference that your target audience makes to your linguistic output”, and is calculated by playing communication games between speakers. This allows the measurement of linguistic diversity without pre-specifing the content of languages. I won’t go into the details of my model in the poster, but I’m happy to answer questions on it. Essentially, it’s an iterated linear regression. Conclusion: Linguistic diversity tracks changes to the social structure. Linguistic diversity cannot be studied without considering dynamic social structures. No special learning ability is required to explain bilingualism – the mechanism required to learn any language allows the learning of multiple languages. The tools available to analyse a problem may bias researchers towards a particular conceptualisation. These might lead to further research questions which are not valid. Hi! I like this blog and i think it’s very interesting. I’m looking for informations about cognitive linguistics, tomasello and his contribution to bilingualism research. Could you give me some help? Are there any books you would recommend about it? I would like to understand if there’s a connection beetween tomasello and bilingualism since i’m writing a thesis about it. I don’t know if Tomasello himself has done any work on bilingualism, but since his theory belongs to Cognitive-Functional Linguistic and Usage-Based Approaches, there’s quite a lot of work on that, I believe, e.g. here’s work by one of Tomasello’s collaborators working on bilingualism. Vyvyan Evans has a nice chapter on how Cognitive Linguistics relates to bilingual language acquisition research here, and you might also want to have a look at the Handbook of Cognitive Linguistics and Second Language Acquisition and this recent article also looks quite relevant to your question.